A shibaigoya (芝居小屋, theater) in Shin-Kyogoku (新京極) in Kyoto, ca 1900s. The flags advertise the Kyoto Office of the Osaka Asahi Shinbun, one of Japan’s largest newspapers. 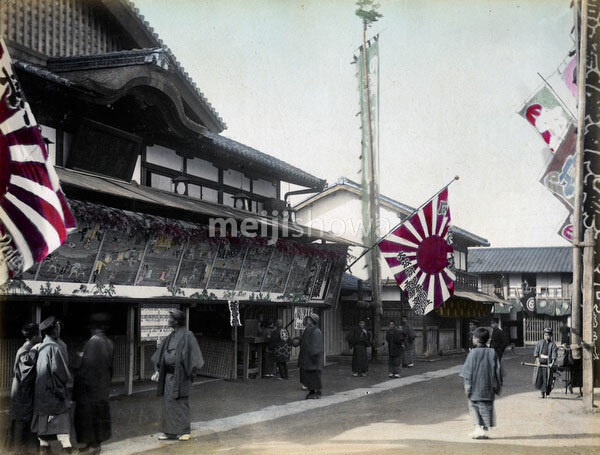 The Kyoto Office was opened in 1897 (Meiji 30). A play about Yaoya Oshichi (八百屋お七, 1669-1683) is on offer. Oshichi lived in Edo (modern day Tokyo) and attempted to commit arson in order to meet the man she had fallen in love with. She was burnt at the stake for her crime.